Haruki Murakami and A Message About Your Question on "South of The Border, West of The Sun"
When my friend Ronald sent me this note, I'm so glad that I choose reading as my hobby; you can learn anything you want in books. 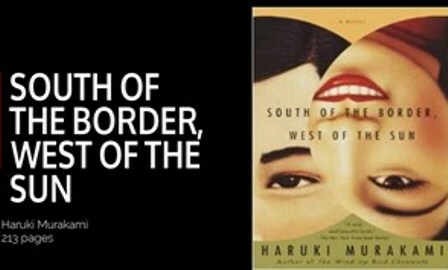 Ronald read "South of The Border, West of The Sun" by Haruki Murakami and he found out that your wrong questions would kill somebody. Check this great note of Ronald Susilo. South of The Border, West of The Sun | Image: Ist. In my town, I mean all my friends who live in my town as far as I know, there is no one who is the only child or does not have any siblings. All of my friends in Ruteng have minimal two siblings. So, they are five or more people in their home. But, when I go to Jakarta then talks with friends out there, ironically that most of my friends are only child or at least they only have one sibling. This is happen because of the different culture between rural and urban are. Or by the difference of spending time with family? Or because of life style? Are all people in urban area use contraceptive? Are crowded area in Jakarta influenced people to have only child? The last question, are people in urban area spending little time with his/her partner? Who should answer this question? For me it is not important to think the answer; we only have to feel and experienced it. This answer I took from this novel, South of The Border, West of The Sun. The same as Hajime experienced in his early life in the school and after thirty years in his life. In the previous time, to have more than one child is a responsibility of family but after time past thirty years, to have only child is a natural way of family life. Some of my friends still plan to get a four or five children because they have not yet get a boy child and some still planning to get girl. This is one of bad manner in human being, I think. If you plan to get more child it is up to you. It’s your right. But if you try to find out a baby girl or boy after three, four or five children, you are tricky and playing with the Owner’s of life. One sentence that I feel nice to read: “All birds had to do was fly in the sky. No need to worry about contraception.” (P.27). In my opinion, the questions are wrong not the person. If you give this question to someone, why don’t you ask: “Hey Bro/Sis how many times do you making love with your partner this week?” If you hear this last question, do you feel this is harshly? Yes, you do! My point is, if you want to make a conversation, use your brain and heart. Don’t make anybody get hurt. Imagine this! After hear that silly question from you, someone going home and suicide. You are the main actor in that tragedy. Are you happy? I guess not. Because that is a normal feeling. But, if you are happy, you must have an inappropriate mind and heart. Immediately, go to the psychiatrist. Choose the right question is the important thing to remember. Our first question when we meet someone is a vital sign. It can lead us to a deeper and warm talk, or not going anywhere. My friend says that, now days our environment of communication is not face to face media but online or social media way of communication. That is why we don’t know anymore how to give a greeting or asking someone in a proper manner. We still think that face to face talking is like talking to someone in our smart phone. Just type and send it. Is that all? NO, IT IS NOT. To give more explanation of the complexity on face to face communication, I give you one nice Murakami’s statement. Try to read and feel it: “In order to succeed, you need luck and brains. Those are basics. But that’s not enough. You need capital. Not enough capital, and your hands are tied. But above all, you need the knack. Without it, all those things will get you nowhere.” (p.71). For me, first question that someone asking me in a first meeting is very important. But for Murakami, he only need to see someone and the rest of that is predictable. See this quotation: “From the first time I saw that girl, I knew I wanted to sleep with her. More accurately, I knew I had to sleep with her. And instinctively I knew she felt the same way.” (P.43). Ronald Susilo adalah seorang dokter, tinggal di Ruteng, Flores. Dokter Ronald juga menulis artikel-artikel kesehatan dan disiarkan di beberapa media massa regional. Di ranalino.id, Ronald berbagi cerita tentang resepsinya atas buku-buku yang dia baca.Dia penggemar buku nomor wahid di Manggarai. Hi dr. Ronald.. tulisan yg menarik..menurut sy talking about manner di lembaga pendidika sptnya berakhir saat kita lulus sd. Selebihnya tergantung lingkungan bergaul dan kebiasaan dlm keluarga... jaman medsos spt sekarang orang2 lbh terbuka dan berani mengemukakan isi hati dan kepala tanpa memikirkan dampak bagi penerima informasi..tatakrama pergaulan di jagad maya tak ada ilmunya..aturan dibuat setelah ada kasus ato kejadian.. masih ada sih yg bisa diulas dr tulisan ini.. tp bhs inggris sy msh terbatas...hehehe..salam !!! Hi dr. Ronald..Menurut saya talking about manner di lembaga formal berakhir saat saya lulus SD..selebihnya lingkungan bergaul dan kebiasaan dlm keluarga yg berpengaruh.. sekarang jagad medsos yg sangat terbuka sedikit banyak mempengaruhi cara orang bertindak dan bertutur kata.. dan kadang2 tidak mempertimbangkan dampak bagi penerima informasi.. sptnya banyak yg bisa diulas dr buku ini termasuk menentukan pilihan dlm hidup. Thanks for sharing!